The latest free pattern for Cloud 9 Fabrics is live! This quilt was designed by Cloud 9’s own Michelle Engel Bencsko to show off Bark & Branch, a new fabric collection by the lovely British print maker Eloise Renouf. This is a really extensive and versatile collection. 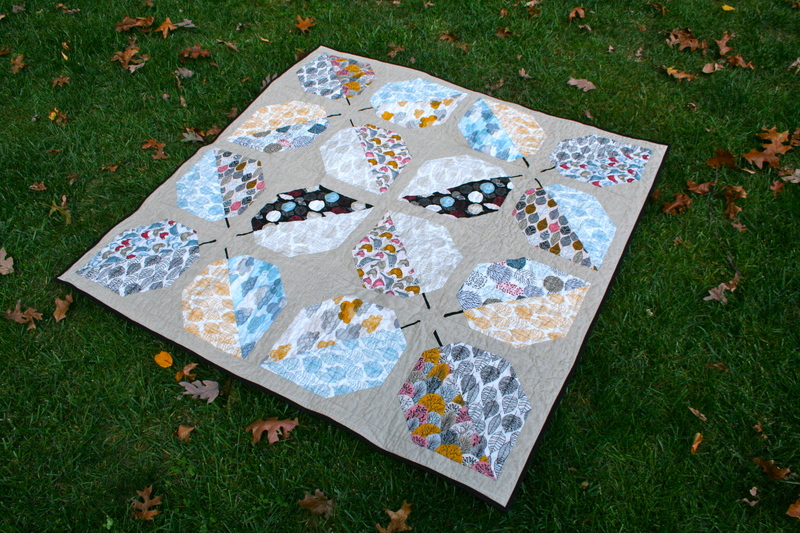 There are lots of leaves, layered clouds, playful birds and two distinct colorways. I really love the blacks, blues and reds, but also found myself drawn to the golds and pinks. My two favorite prints are the bold ones, Autumn Wonderland and Nature Trail. This was a fun process. Michelle had a vision for the quilt and diagrammed it out for me, then I made some test blocks and put the quilt together. On the pattern I am featured as “Technical Editor.” I like it. Download it here. And the quilt! It really captures the essence of the changing seasons. My creative input was the quilting, for which I made a bark design. The knots were free motion quilted in an ovular spiral, then I used my walking foot to make wavy parallel lines. It was quick and gives nice texture, especially after a wash. I love that it’s finally quilt season again! This one is perfect for a fall snuggle. Thanks for checking it out, and as always, let me know if you make it! Lovely fabrics, and a very clever idea for the quilting, which looks great. 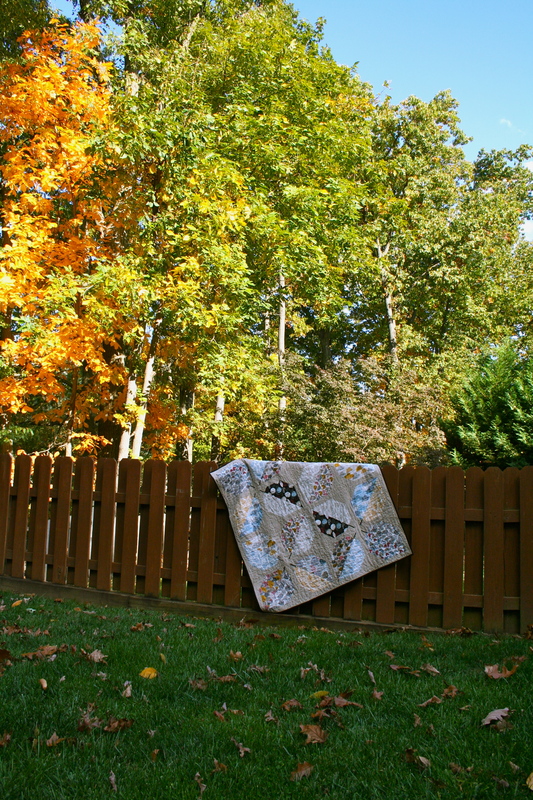 The bark design for the quilting is perfect for this pattern! Love it! 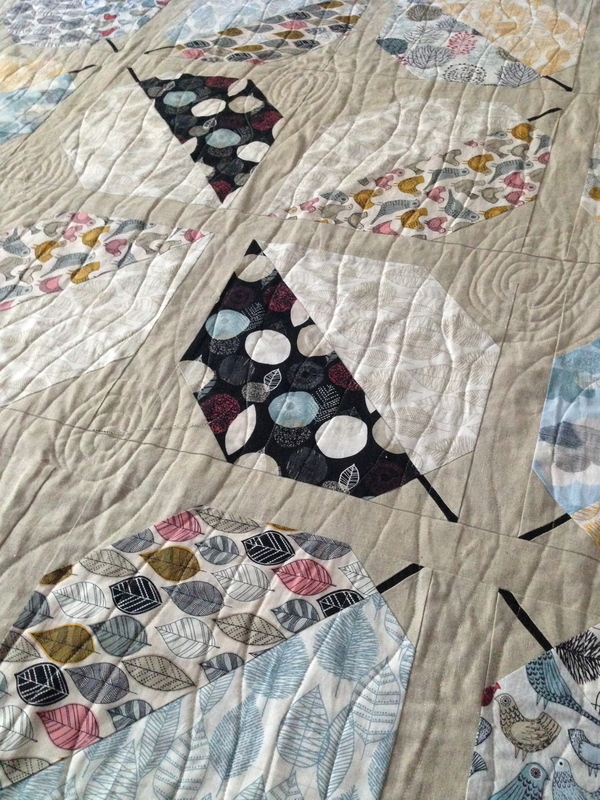 I am crazy about this quilt, especially the quilting! am going to order the fabric very soon and shamelessly replicate it!! :) thank you for the inspiration! Thank you so much! If you do, please let me know.